Emily Prior, Communications and Engagement Manager at NHS England (South), blogs about the importance of communicating accessibly. I recently hosted a training day for health and social care colleagues from Transforming Care Partnerships across the south of England. 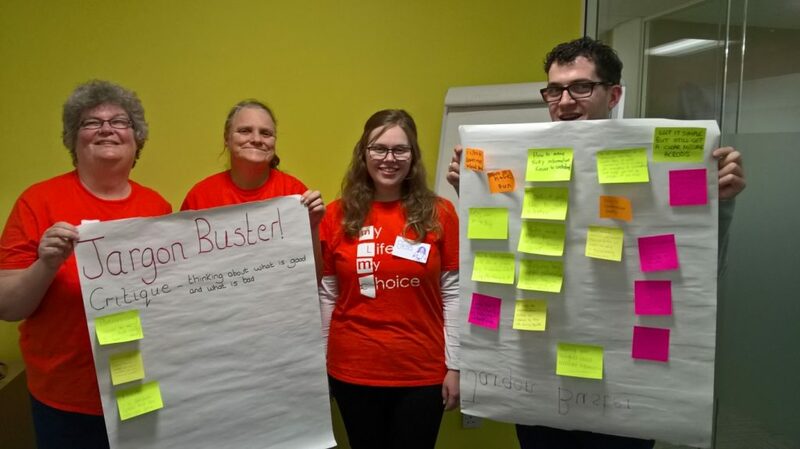 We came together to master the art of producing easy read material – created specifically to help people with a learning disability understand information easily. Providing easily accessible communications is a Transforming Care Programme priority so we asked My Life My Choice to show us the ropes. The training day taught attendees ‘how to’ while also offering an opportunity to really reflect on and think carefully about how we as individuals, Transforming Care Partnerships and wider health and social care communities, communicate – often not in an accessible way, particularly for individuals with a learning disability, autism or both. Easy read training will help us meet our legal duty to communicate accessibly, which is vital given as of the 1st August 2016; all organisations that provide NHS care or adult social care are legally required to follow the Accessible Information Standard. The standard aims to make sure that people who have a disability, impairment or sensory loss are provided with information that they can easily read or understand and with support so they can communicate effectively with health and social care services. *If I Ruled the World is a game whereby the first person in the circle announces their name and has to make a statement about what they would do if they ruled the world.